Famous assassinations [though not a matter of pride but a painful similarity] such as in USA, Abraham Lincoln, JF Kennedy, Robert Kennedy, Martin Luther King were assassinated. In India, Mahatma Gandhi, Indira Gandi and Rajiv Gandh. Both have a big film industry with lots of film stars. Watching movies in both the countries is a very popular pastime. Citizens in both these countries have a lot of admiration for their movie stars and they imitate their film stars fashion. 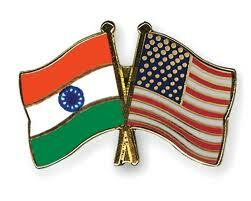 Why Indo-US relation is important?? "China is militarily and economically very assertive. It is facing so many bi-lateral disputes such as with India, Japan, Vietnam, etc. Its economic policy is very simple enter, flood and destroy. Enter: entry into other country's economy through bilateral relation, FDI etc. Flood: flood the economy with cheap goods. Even many times we chose cheap chinese products over indigenous product. Destroy: Need i explain? Destroy by weakening the backbone of any country's economy i.e. its domestic market which are its own manufacturing sector, agriculture sector,etc. Many diplomatic reasons such US not backing Pakistan's stand on J&K,etc. So imposed many international economic sanctions on Iran to create pressure to stop any such effort. India caught in between why?? any destabilization there will cause economic loss to us as we have made huge investments there in terms of mineral exploitation, education tie-ups, hospitals, etc.